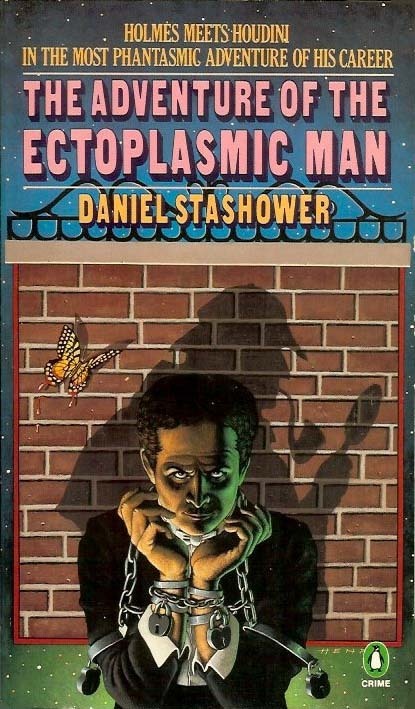 Paperback edition of Daniel Stahower's 1985 novel that teams Sherlock Holmes with Harry Houdini. Stashower would go on to pen a series of "Harry Houdini Mysteries" in the early 2000s. Cover art below is by Neil Stuart (design) and Doug Henry (illustration). You can see the hardcover HERE. THE WORLDS GREATEST DETECTIVE AND THE KING OF MAGIC TEAM UP TO SOLVE "THE CRIME OF THE CENTURY"
When Harry Houdini is framed and jailed for espionage and Sherlock Holmes vows to clear his name, the two join forces to confound the crooks who are out to blackmail the Prince of Wales. It's a case that requires all their special skills––and then some. As Houdini reduces his body to ectoplasm, Holmes deduces how he does it. And when Houdini makes a daring exit from Scotland Yard, Watson becomes the only person ever to actually see him escape from a prison cell. The magical entertainment, glittering with suspense, comedy, and romance, is a must for Sherlock Holmes fans of lovers of adventure and mystery in grand style.